Lesbos is an island in Greece. It is in the northeastern Aegean Sea. 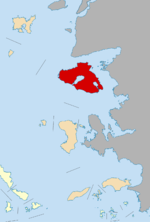 It is one of 51 prefectures of Greece. 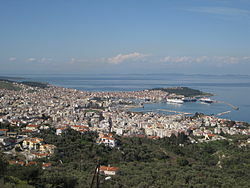 The capital of Lesbos is the Mytilene. According to Classical Greek mythology, Lesbos was the patron god of the island. The word 'lesbian' comes from Lesbos. An ancient poet, Sappho, lived on Lesbos. Many of her love poems are written to women. This page was last changed on 2 June 2014, at 17:20.